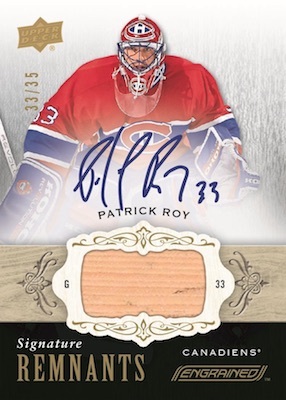 Debuting with NHL card collectors, 2018-19 Upper Deck Engrained Hockey is built around engravings, wood designs and hockey sticks. Each Hobby box averages one Signature Shots autograph, two additional hits that can be autographs or relics, and one insert or base parallel. 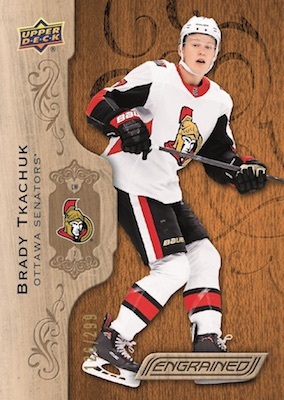 Using a "faux wood" style, the 100-card base set in 2018-19 Upper Deck Engrained Hockey features 31 stars, 19 legends and 50 rookies. Every card is numbered to 299 and there are also Black parallels that are limited to 49 copies. The base set also works in numbered Premium Memorabilia and Premium Memorabilia Autograph editions. The Premium Autograph cards cover select stars (1:8 packs), legends (1:12 packs) and rookies (1:3 packs) from the base set. Synthesis inserts combine with the base Black parallels to average one per box. Synthesis cards also come in a rare Grip variant numbered to 50 copies. 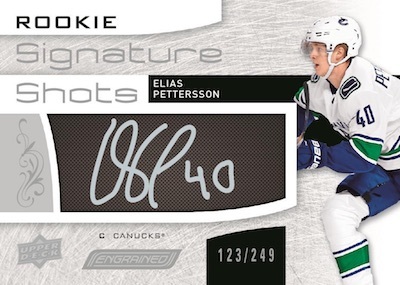 At one per box, the main autograph set in 2018-19 Upper Deck Engrained is Signature Shots. 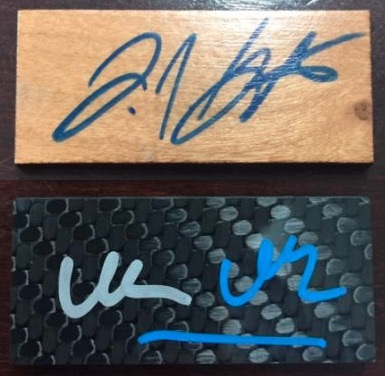 Walking the line between a sticker signature and hard-signed, the Signature Shots and Rookie Signature Shots cards contain a trapped autograph. Going with the hockey stick approach, these are actually signed on a piece of varnished wood or carbon fiber. If that's not enough, other stick-filled inserts include triple-relic Complete Sticks (#/25) and Complete Sticks Signatures (#/25). The numbered Remnants (#/100) and Signatures Remnants cards offer a game-used stick piece for over 50 Hall of Fame players and also current stars. As many as 100 Remnants cards are expected, as well as 25 signed editions. 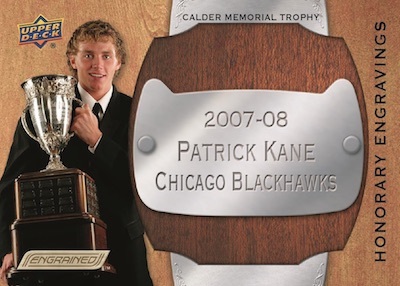 According to Upper Deck, the impressive Dual Stick Nameplates (1/1) cards are "perhaps the finest NHL-licensed memorabilia cards ever made." 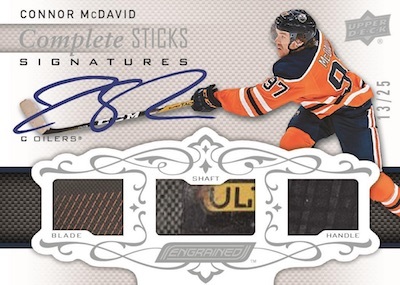 2018-19 Upper Deck Engrained Hockey keeps the hits rolling with Distinguishing Marks (1/1), Flexures (1:50 packs) and Signatures Flexures (1:12 packs). Finally, Carved in Time (1:10 packs) uses a solid-wood card layout and the Honorary Engravings (#/100) line features replica trophy nameplates.